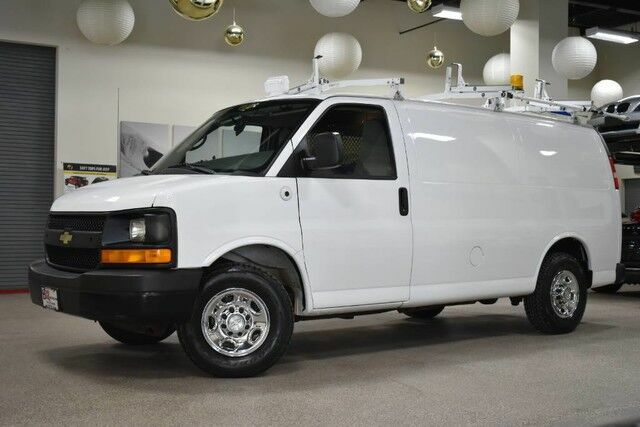 2011 Chevrolet Express G2500 Cargo Van 1-Owner vehicle has been owned by Verizon fleet and has been well maintained and well taken care of, it comes with a lot of extra stuff. Drives very solid and it is in excellent condition inside and out, please look at all the pictures to see how nice this vehicle is. This Chevrolet includes: SUMMIT WHITE TRANSMISSION, 6-SPEED AUTOMATIC, HEAVY-DUTY, ELECTRONICALLY CONTROLLED Transmission Overdrive Switch A/T 6-Speed A/T MIRRORS, OUTSIDE HEATED POWER-ADJUSTABLE, BLACK, MANUAL-FOLDING Power Mirror(s) Heated Mirrors NEUTRAL, CUSTOM CLOTH SEAT TRIM Cloth Seats BACKUP CAMERA STROBES INVERTER MASTER SYSTEM PRIME DESIGN ROOF RACK *Note - For third party subscriptions or services, please contact the dealer for more information. * Your buying risks are reduced thanks to a CARFAX BuyBack Guarantee. The Express Cargo Van has been lightly driven and there is little to no wear and tear on this vehicle. The care taken on this gently used vehicle is reflective of the 103,131mi put on this Chevrolet. Rare is the vehicle that has been driven so gently and maintained so meticulously as this pre-owned beauty.